Based in New Jersey, My Chemical Romance is an alternative pop/rock and punk-pop band that has been compared to Thursday and, to a lesser degree, Cursive. Their name was inspired by author Irvine Welsh (of Trainspotting fame), and while many of their songs are loud, fast, hyper, and aggressive, My Chemical Romance’s work also tends to be melodic and pop-minded. My Chemical Romance got started in the early 2000s, when lead singer Gerard Way and drummer Matt Pelissier decided to try writing some songs together. The first tune that Way and Pelissier — who had been friends since high school — came up with was called “Skylines and Turnstiles” (a post-9/11 song written after Way witnessed the Twin Towers fall while working at his animation job in New York City). Way and Pelissier both felt good about the song, and Way asked guitarist Ray Toro if he would be interested in working with them. 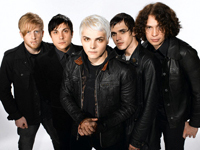 My Chemical Romance’s five-man lineup was complete when Way, Pelissier, and Toro joined forces with bassist Mikey Way (Gerard’s little brother) and guitarist Frank Iero. With that lineup in place, the band started playing all around the Northeast Corridor and made plans to begin working on their first album. In 2002, Eyeball Records (the New York-based indie for which Thursday had recorded) released My Chemical Romance’s debut album, I Brought You My Bullets, You Brought Me Your Love. The album was often compared to Thursday — a comparison that, for various reasons, was inevitable and unavoidable. Both bands were from New Jersey, both had recorded for Eyeball, and both combined punk-pop’s musical aggression with introspective, confessional lyrics. Plus, I Brought You My Bullets, You Brought Me Your Love was produced by Thursday vocalist Geoff Rickly. But Thursday isn’t their only influence; reviewers have cited the Smiths, Morrissey, the Cure, and the Misfits as influences, while the older Way has even cited British heavy metal icons Iron Maiden. Lyrically, I Brought You My Bullets, You Brought Me Your Love is as dark as it is introspective and cathartic; Way has been quoted as saying that the band’s lyrics were a great way for him to deal with the problems he had been going through (which included severe depression, drug/alcohol abuse, and a serious illness in his family). The 2002 release included Way and Pelissier’s first song, “Skylines and Turnstiles,” and many of the album’s other song titles were equally intriguing, including “Honey, This Mirror Isn’t Big Enough for the Two of Us” and “Vampires Will Never Hurt You.” In 2003, My Chemical Romance signed with Reprise/Warner Bros. and released the aggressively slick Three Cheers for Sweet Revenge one year later. Proving to be hugely popular, the album boasted several successful singles on commercial radio and MTV, including “I’m Not Okay (I Promise),” “Helena,” and “The Ghost of You,” as the album climbed the Billboard charts.